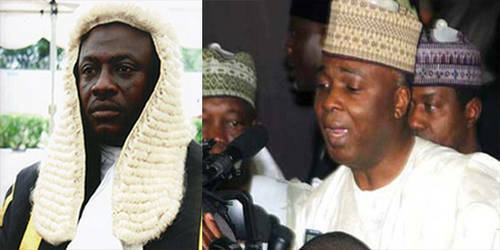 A Federal High Court judge who was recently accused of accepting bribe from Senate President Saraki in a bid to stop his corruption trial has stepped down from the case. Justice Ahmed Mohammed of the Federal High Court excused himself from the case on Wednesday, and transferred the matter to the Chief Justice of Nigeria, Mahmud Mohammed, for reassigning, the News Agency of Nigeria reported. He said he took the decision due to “negative reports”. Justice Ahmed reportedly quit the case in order to get the bribery scandal off his neck. Tinubu and short elrufai are the people acusing saraki bcos of their selfish interest in 2019, satan will purnish them. IF THE MAN IS CORRUPT THEY SHOULD SACK HIM AND HIS FAMILY! Yeah! I have envisaged that kind of action. That is the only possible option left for Saraki to get himself break free from this mess. Our judiciary branch is so corrupt that I don’t even trust anyone of them. Saraki is nervous now that he his ready to offer any unprincipled judge in that case the offer they may not reject but thanks to anti-corruption watch-dogs who quickly blew the whistle. Jamoon, ur name sound, u live in the moon,not in naija,where saraki get all those money from, salary ….stop playing game, that man is not a leader,they milk naija dry.he should go away, Naija Govt,take over all those money ,not only Saraki many like that, milk Naija dry,should come to book,punish never rule again. bukola saraki seems to look like a man of intergrity in Nigeria and yet in his own state kwara, he will be stone and stone with sachet water even in a praying ground, i beleive some few house of assembly member knew whom their are dealing with, he is a danger.